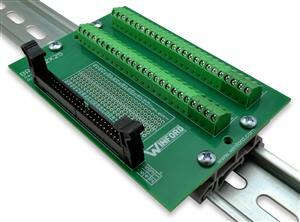 This breakout board contains a 50-pin dual row male header with 2mm pin spacing. Each of the 50 connector pins is brought out to screw terminal blocks, allowing connections to be made easily. Each pin is also brought to solder pads (3 per pin) at 2mm spacing, allowing easy addition of 2mm pin headers or other components. Please note that the breakout boards are manufactured with a connection between each connector pin and the corresponding terminal block position; no soldering of any type is necessary. The solder pads simply provide an area for making optional connections to additional headers or other components. This break out board is perfect for production applications as well as experimentation and prototype work. It is well-suited for interfacing with microcontroller programming circuits, I/O ports, DAQ equipment, and any other device that uses a 2x25 50-position header with 2mm pitch pin spacing. The header on this breakout board comes with long ejector latches installed. "Long ejectors" indicates that the ejectors are the correct length to accomodate typical IDC connectors with strain reliefs installed. A dual row header is sometimes referred to as an "IDC Header", "IDC connector", or "ribbon cable connector". A breakout board is sometimes referred to as a "transition module", "terminal board", "terminal block", "breakout box", "breakout adapter", "terminator", or "interface module". Approximate dimensions: 2.875" x 4.25"